The V-Strom first appeared in 2002 and was immediately popular due to the reputation of the 1000cc V-twin engine derived from the TL and SV family as well as the price. 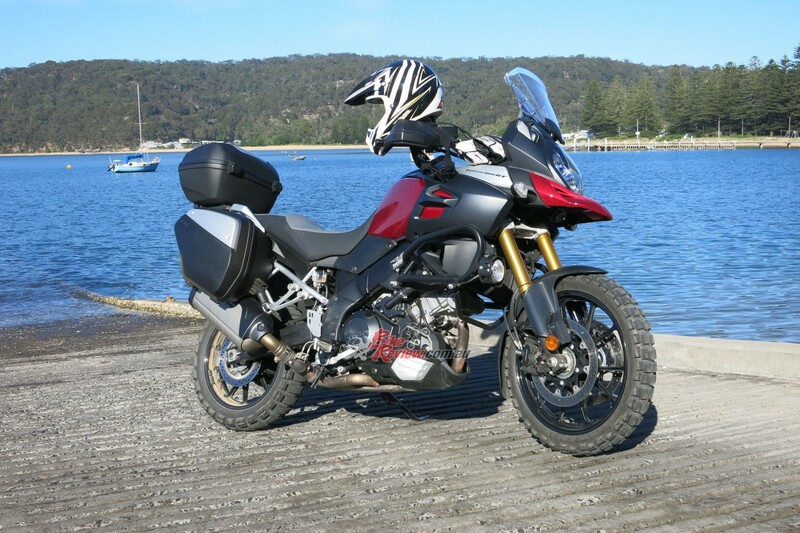 The V-Strom was affordable and more of a basic entry level adventure tourer than some of the more expensive dedicated Euro adventure bikes. 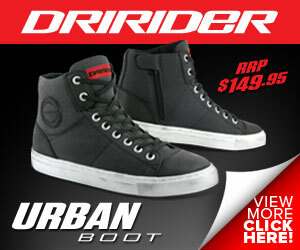 It was popular here in Australia in particular, due to our poor road condition and vast distances of off road riding. 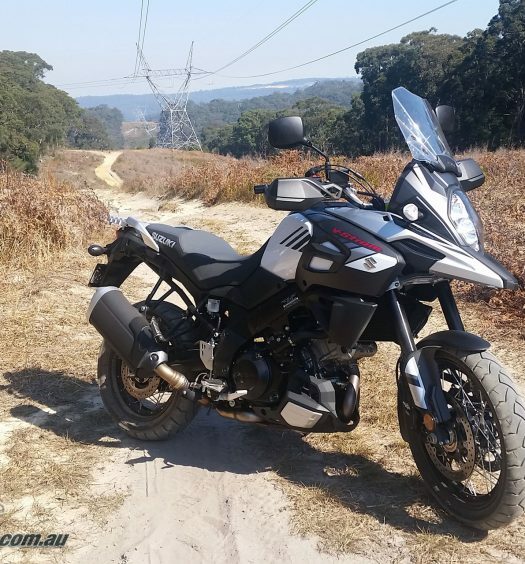 The V-Strom 1000 was also very popular with sportsbike or nakedbike riders looking for a more versatile option, a bit more comfort and off road ability, while still having a thrill on the roads. A 650cc version appeared in 2004, which was equally as popular, mainly due to the more useable and sedate nature of the engine. The 1000cc version had a reputation for being a little peaky and aggressive. In 2004 the 1000cc version was updated with some technical refinements but until the 2013 model nothing changed and sales were not as strong as the 650. In fact globally, 140,000 650s have been sold and only 46,000 1000cc versions. 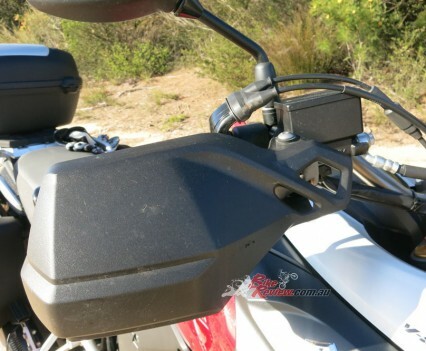 The new updates, however, should see that number balance out more as one key factor was that the V-Strom 1000 had to be discontinued in the huge European market due to not meeting the strict Euro 3 emission regulations.The new model was completely rebuilt from the ground up, with Suzuki aiming the bike squarely at experienced tourers. Designed for long-haul riding in all conditions, in as compact and light a package as possible, the V-Strom is labelled a ‘Sport Adventure Tourer’ by Suzuki. 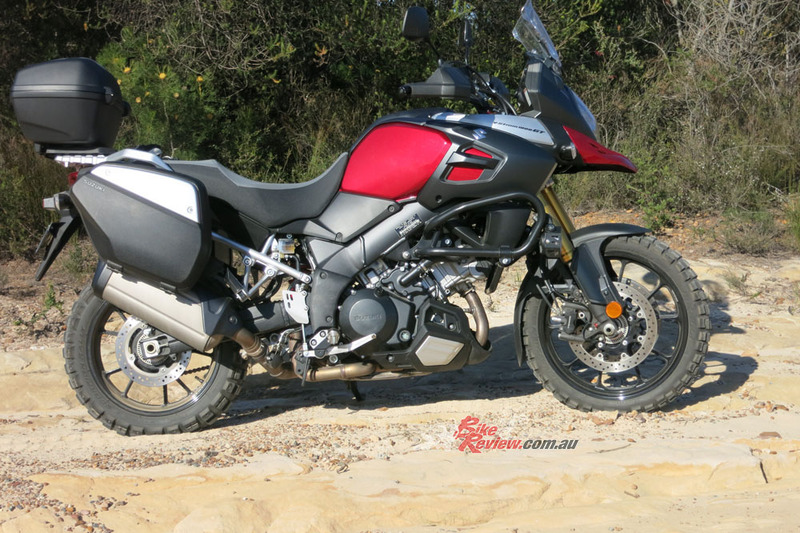 Mostly designed for on road touring, the V-Strom is in the same category as the Ducati Multistrada and Aprilia Caponord. 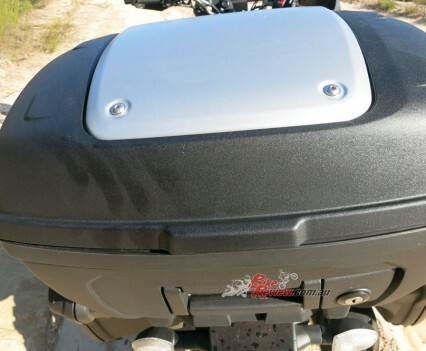 It features a powerful 1037cc V-twin engine, ABS and radial-mount brakes, three-mode traction control, a multi-function dash display, 12V DC outlet for charging devices, an adjustable screen, vertically stacked headlights, great luggage options and lots of accessories are available such as panniers and top box, high seat, knuckle guards, centre stand, oversize screen, low seat, heated grips, crash bars, engine guard, bash plate, fog lamps, chain guard in alloy, LED indicators and even a tank bag. If most of your riding is on tarmac and you only hit the odd bit of gravel a bike like the V-Strom is for you. Don’t under estimate what the Suzuki can do off road, though, as the Japanese underplay the off road abilities. 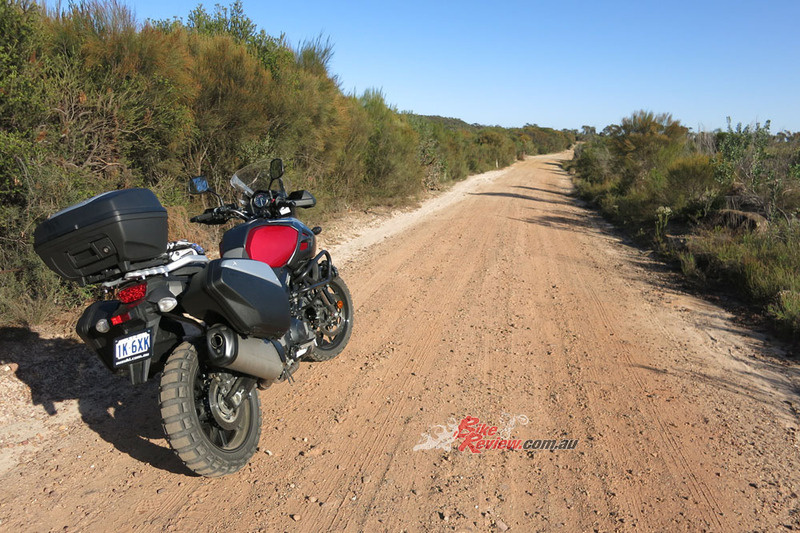 With decent knobby tyres and the ability to turn the ABS off the V-Strom could be a real front-runner off road in the adventure market. But for now, it needs to be considered as an 80/20 bike. Think Suzuki Vitara, the latest one, not the hard-core old full chassis one. So what do you get? For full technical info refer to the technical breakouts. In short, you get ABS and three-mode traction control as standard. The TC can be de-activated but the ABS cannot. You also get fully adjustable forks, an adjustable shock, and an adjustable screen. For extra spend you might want to deck the bike out with a minimum, in my opinion, of factory panniers, knuckle guards, heated grips, bashplate, crash ‘bars and engine covers. The bike I tested had the above plus the spotties and the tall seat. 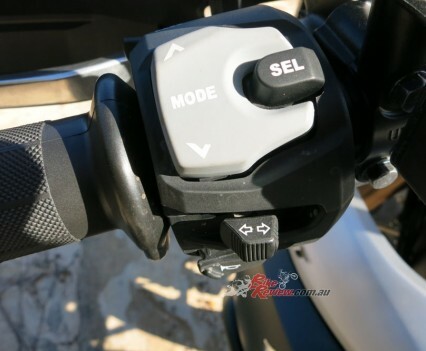 There is no cruise control option unfortunately and this will probably remain the case until the V-Strom has its next update and possible goes RbW. 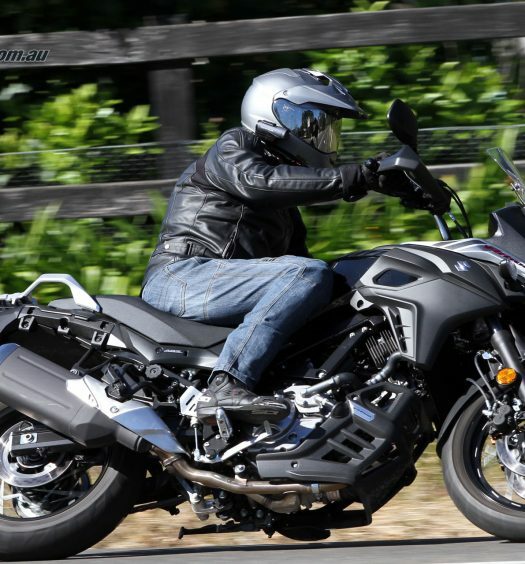 As soon as I hopped on the V-Strom 1000 I noticed how much lighter, or more balanced, it feels to the previous model. Coming n at 228kg dry is not too bad and pretty average in class, but that weight has been well positioned on the bike. 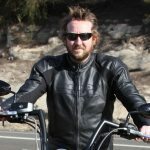 The narrow feel between the knees is there thanks to the V-twin engine configuration and I also noticed that the bike is generally less bulky thanks to the two-into-one exhaust system that replaces the old twin muffler set-up. This bike has the panniers on but almost feels the same width as the old one did without them. 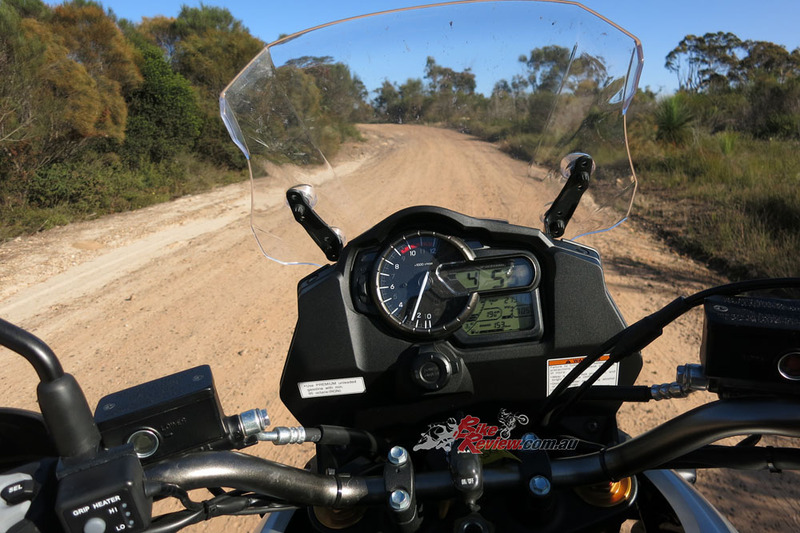 I tested the V-Strom 1000 on a wide variety of roads, from freeway to twisty mountain turns, bumpy country roads and gravel and dirt sections. I tried it all aside from a long distance or long hourly stint. The longest I was able to spend on the V-Strom, purely because of circumstance, was an hour. So I’ll pass on the seat and comfort comments for long hauls. I can say it’s comfy for an hour. In urban traffic the V-Strom is well behaved, smooth and easy but of course too wide to lane filter most of the time. Heat from the engine is not a problem and engine temperature is well regulated. The height of the bike and the wide ‘bars mean a bike like the V-Strom is more of a handful than a nakedbike for example but you could still use this as a daily urban rider. Out of town, however, the V-Strom stretches its legs and comes to life. Freeway cruising is sensational as the big twin ticks along at around 4200rpm in top. The screen does a great job and despite me being tall I preferred the lowest setting, just to get some breeze. Cruise control would be fantastic… there are no bad vibes to cause pins and needles and the seating position is comfy. 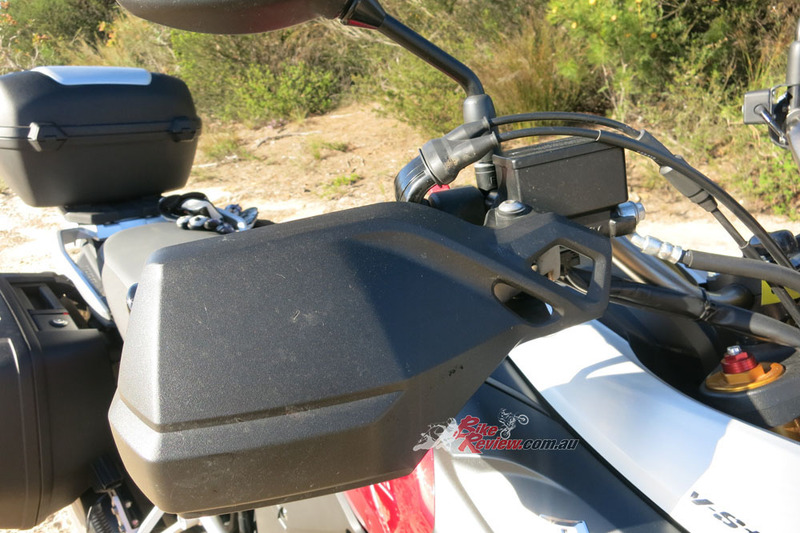 You get a good commanding view on the V-Strom so it is great for keeping control of the tin tops around you. With a 20L tank there is plenty of fuel range, with a potential 320km from a tank in the real cruising world. The heated grips and knuckle guards on my press bike are fantastic and would be top of the list for me as options. Wide open fast flowing country roads are easily soaked up on the V-Strom. These roads are often isolated enough to be police free, have great visibility through corners but are littered with huge bumps and often road debris. A sportsbike or nakedbike would not get near a V-Strom in these conditions. You can hit bumps, even on an apex, flat out at full lean and the plush suspension and 19in front wheel soak it up. 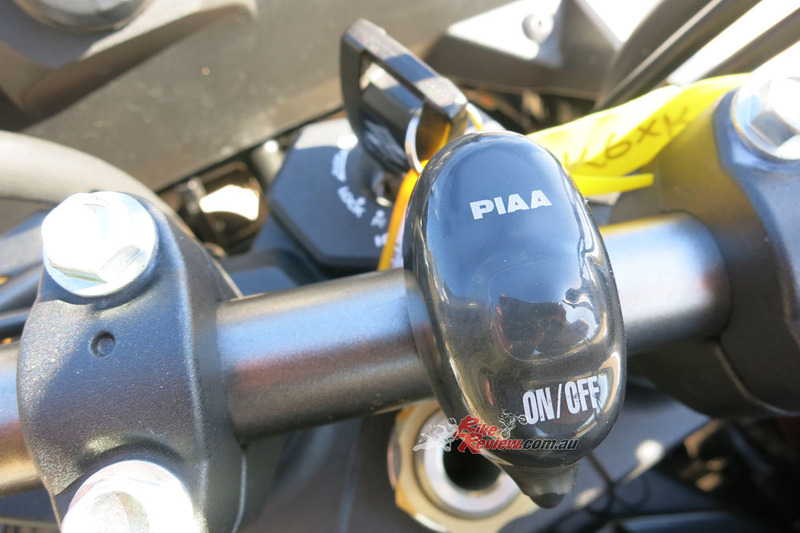 The addition of the ABS gives an extra level of security while exiting hard on the gas, with all that torque on tap; the three-mode traction control is a nice back-up. I used Mode 2 most of the time and aside from a few times I hit loose gravel the TC was not activated often, with the light flashing before I even realised at times. The engine is very mid-range tuned, meaning despite revving beyond 10,000rm, the maximum benefit is between 4000 and 6500rpm. After that, the V-Strom engine goes flat and there is no point revving it beyond there. 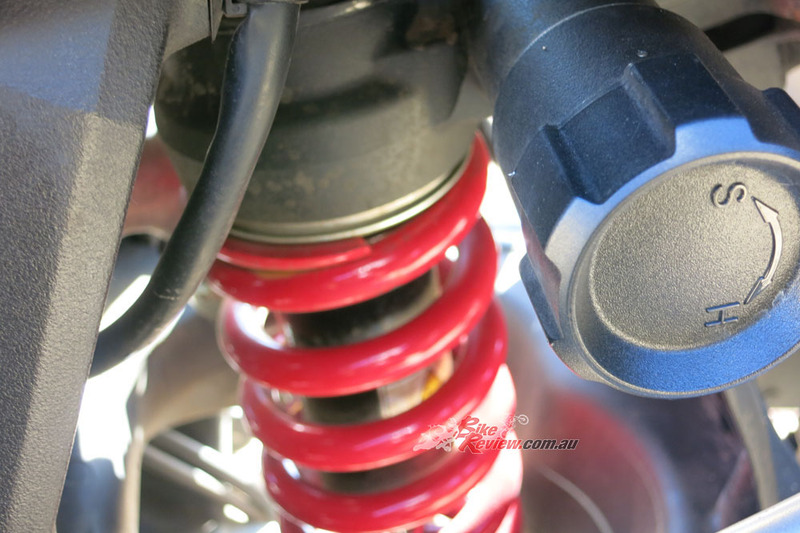 For sports riding, the suspension at both ends needs firming up. This is a quick roadside task and worth the effort. The standard set-up will have the bike floating and pitching too much but dialling in some more support transforms the bike. There is good front end support on the brakes into turns, or hard braking upright, and the bike settles quickly mid turn. 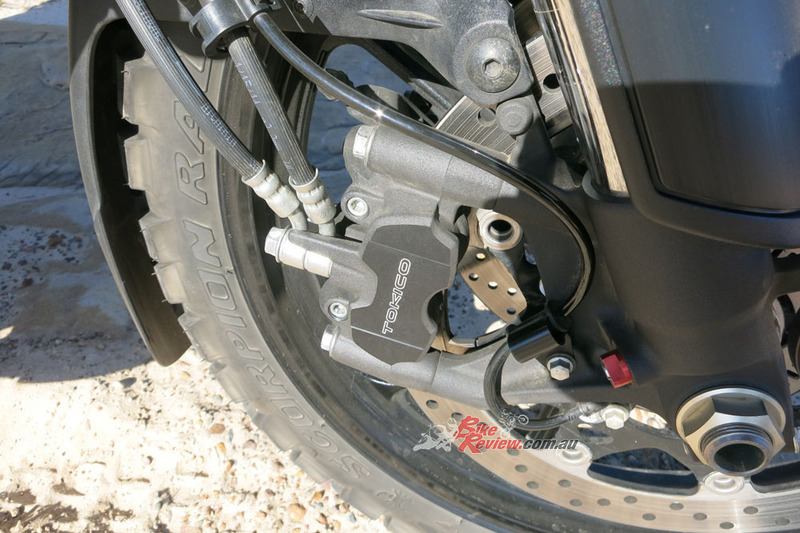 Off corners there is some rear pumping as the shock tries to cope with the grip, torque and weight all at once and if anything a shock upgrade to a quality fully adjustable unit would benefit a rider who spends a lot of time in the corners. 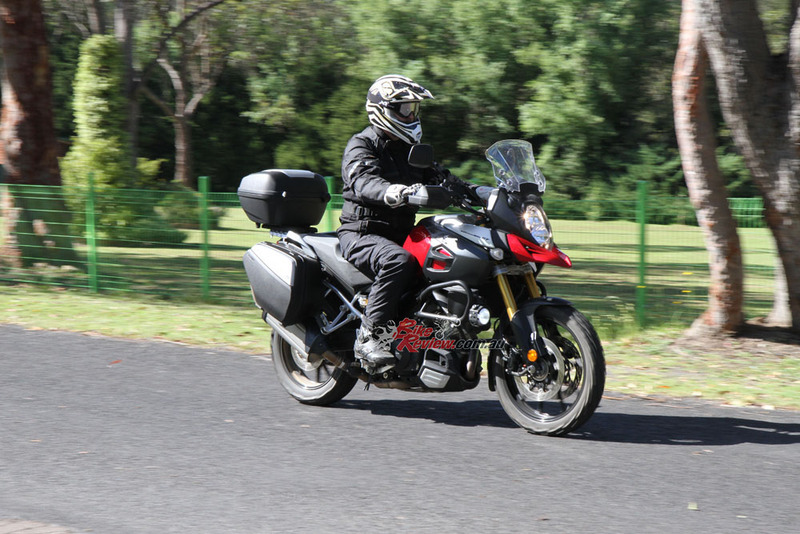 Overall though, the V-Strom is a great handling bike that brings confidence. 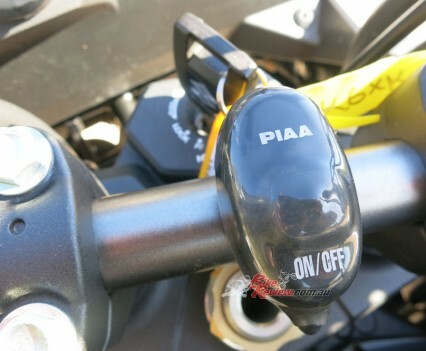 You also get buy on the gearlever trying to keep the bike in the fat part of the power before it drops off. Ground clearance is adequate for the type of bike this is and the brake are sensational. The four-piston radial-mount Tokicos and 310mm floating rotors are matched to a near spot on master-cylinder ratio, as there is strong initial bite and progressive power that is easily modulated, giving the rider good feel and not upsetting the balance of the bike. This means the V-Strom is stable on the brakes. The rear brake on the press bike I rode lacked feel and power but I put that down to worn or glazed pads. Off road the V-Strom is very capable, more so than would be expected. The torque and throttle response of the engine means that there is plenty of wheelspin with the TC off but with it on the constant interference becomes a drain. The ultra tall gearing of the bike also makes off road riding difficult, particularly first gear stuff. On open dirt roads the V-Strom copes well. Like all big adventure style bikes with serious power, you need to keep on the job as you find yourself carrying some incredible pace – however, with no option of switching ABS off pulling up the V-Strom is tough off road. Ground clearance is a limitation as well. The press bike had the optional bash plate fitted but I was constantly concerned about the underside of the bike. Handling-wise, the suspension and chassis are great off road – but again the ABS severely limits the ride. 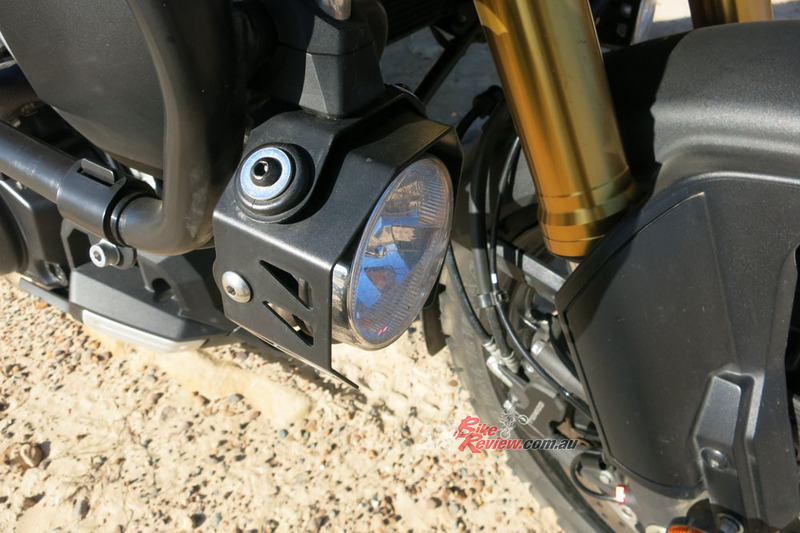 In summary, the V-Strom 1000 will suit the rider that spends a lot of time touring on tarmac but needs the option of tackling long stints on dirt or gravel roads and even the odd fire trail. A great bike and good value. The V-Strom 1000 is powered by a 90-degree liquid-cooled eight-valve DOHC fuel injected four-stroke with a capacity of 1037cc. The engine is designed with broad power and useability in mind. The 100mm SCEM coated bore houses FEM pistons, while the stroke is 66mm. Compression ratio is 11.3:1. The cylinder-heads house two spark plugs per cylinder, giving a cleaner more efficient burn and better low down running. 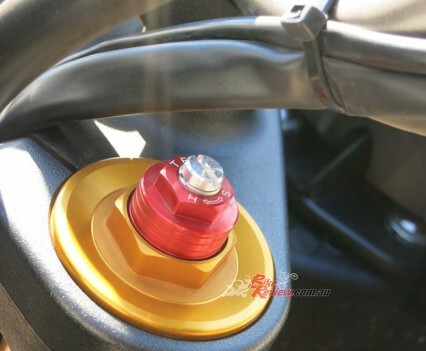 The iridium plugs also strengthen spark and last longer. The combustion shape and efficiency help give the V-Strom a smooth throttle and run more fuel efficiently. Each spark plug has its own individual coil, which allows for more independent control of ignition timing and better low rpm output. Fuelling is via the fantastic Suzuki Dual Throttle Valve (SDTV) system. 10-hole fuel injectors are utilized and fuel economy is stated at 20.9L/100km. 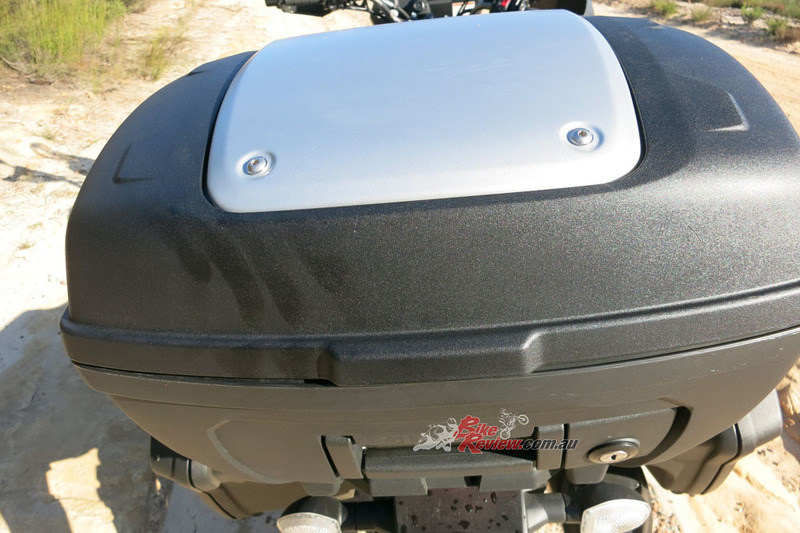 The airbox is a compact 6.5L unit with a large aircleaner element designed for road and off road, while the exhaust system is a two-into-one with SET (Suzuki Exhaust Tuning) ECM-controlled valve. The engine is cooled by a large capacity 22.7kW radiator, eliminating the need for an oil cooler. The bottom end houses a six-speed gearbox with a 1.00 top gear ratio as an overdrive. 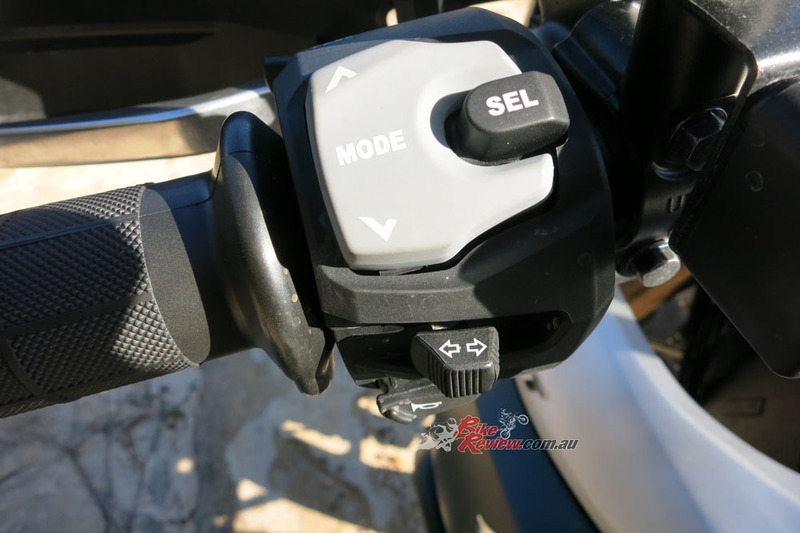 For smooth backshifts a Suzuki Clutch Assist System has been employed, which gives a light action at the lever but mechanical assistance on launch as well as clutch slip on downshifts, reducing engine braking. The V-Strom chassis is a compact and lightweight design that provides performance over a wide range of riding situations. Suzuki developed the chassis with urban roads, rough country roads, highways, gravel roads and twisty mountain roads all in mind. The seat and frame are narrow, due to the V-twin engine layout, which means it is easy to reach the ground. The main frame was designed using FEM analysis technology and is 13 per cent stiffer than the first V-Strom frame. The sub-frame is steel while the swingarm is cast alloy. The forks are fully adjustable 43mm inverted KYB items and the shock is an adjustable Showa unit. 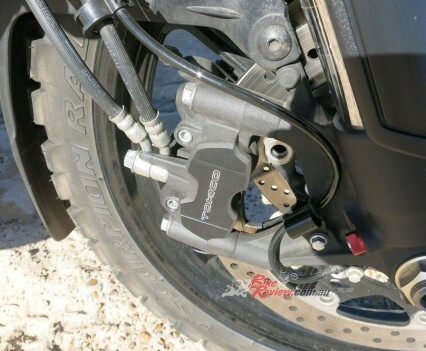 Front brakes on the V-Strom 1000 are radial-mount Tokico monoblock units with 310mm floating rotors. The caliper piston sizes are 32mm and 30mm. The rear brake is a 260mm rotor and single piston Nissin caliper. The wheels on the V-Strom are 10-spoke cast-alloy items made by Enkei. Front axle diameter is a large 25mm, as is the rear axle at 28mm. The front wheel is 19in, the rear 17in. The bodywork was wind tunnel developed including the adjustable screen with adjustable height and pitch. There are three levels of height and pitch. A 32-bit engine control module is featured that provides state of the art engine management, including the adoption of ISC (Idle Speed Control). 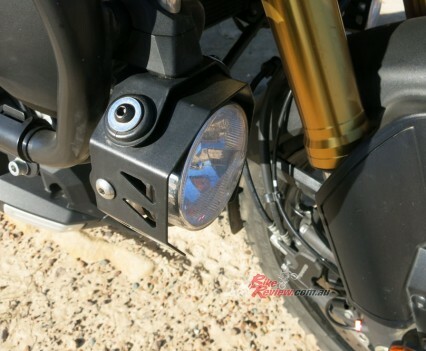 A three-mode traction control system is in place on the V-Strom 1000. It features a TPS, rear wheels sensor, gear position sensor, crank position sensor, front wheel speed sensor all providing info the ECM. 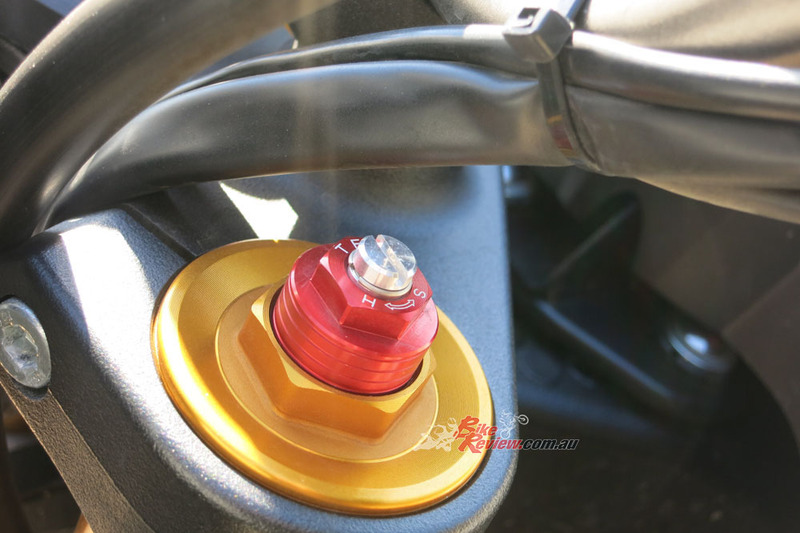 As soon as rear wheel slip is detected ignition timing and air delivery is adjusted to eliminate the slip. Mode 1 is the lowest sensitivity and allows some wheelspin. 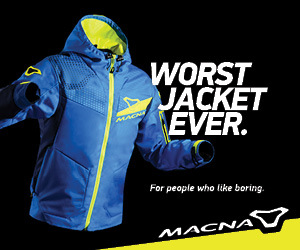 Mode 2 is more sensitive, for general riding, while Mode 3 is for poor conditions where more TC is required. A Bosch ABS control unit measures wheel speeds 50 times per second, providing maximum stopping power and safety. The ABS cannot be switched off. The multi-function LCD dash features speedo, gear position indicator, average fuel consumption, instant fuel consumption, voltage, air temperature, fuel level, TC setting, engine temperate and is adjustable for brightness. There is also a 12V DC outlet on the dash for charging mobile devices and GPS. Engine: Liquid-cooled 90 V-twin eight-valve DOHC four-stroke, 100 x 66mm bore x stroke, 11.3:1 compression, 1037cc, EFI, traction control, dual throttle butterfly system. 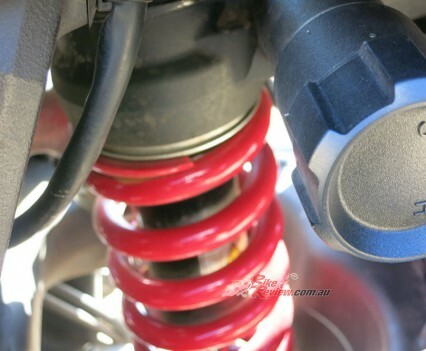 Suspension: 43mm inverted fully adjustable KYB forks, rear Showa monoshock with preload and rebound adjustment. Brakes: Dual 310mm floating rotors with Tokico four-piston monoblock calipers and ABS (f), 260mm rotor with single piston Nissin caliper and ABS (r). Wheels & Tyres: Cast alloy 10-spoke 19in front, 17in rear. You’d have to be riding fast and accelerating at every opportunity to get a mere 320 kms from a tank. A well run in bike at legal-ish speeds will see more than 400 kms no problem.